The Port of Indiana-Burns Harbor completed a landmark year in 2017 and is poised for significant future growth as a result of several historic developments. “We had a strong year in part because our world-class companies continue to drive new business through our port,” said Port Director Ian Hirt. “Going forward, we plan to build on this success and make sure this port is well positioned for the future." The Port of Indiana-Burns Harbor completed a landmark year in 2017 and is poised for significant future growth as a result of several historic developments. In addition to handling an 8 percent increase in cargo shipments in 2017, the port doubled the size of its bulk terminal, attracted a nationally-renowned stevedore in Metro Ports, handled its most valuable cargo ever, and announced a $20 million expansion made possible by earning one of only 10 “FASTLANE” small project grants awarded in the U.S. last year. The Port of Indiana-Burns Harbor handled 2.8 million tons in 2017 completing the highest four-year total in the port’s history, a 27 percent increase over the previous four-year period. Cargoes contributing to the 2017 increase included limestone, steel-related products and heavy lift/project cargoes, such as refinery tanks, laboratory equipment and windmill components. 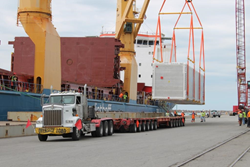 The most valuable shipment ever to cross the port’s dock was called “ICARUS” – the world’s largest liquid argon particle hunter – which was unloaded from an ocean vessel in July by Federal Marine Terminals (FMT). Hundreds of Twitter users followed the device via #IcarusTrip as it was shipped in two semi-truck sized containers from Switzerland to the U.S. Department of Energy’s Fermi National Accelerator Laboratory (“Fermilab”) in Batavia, Ill. The port is a preferred hub for oversized cargoes being shipped by ocean vessels into the Midwest. In 2017, the port was awarded a $9.85 million grant by the U.S. Department of Transportation that will supplement an approximately $20 million expansion, which includes the construction of two rail yards, a new shipping berth, a truck marshalling yard, a 1,200-foot dock expansion, and a new bulk cargo terminal with multimodal connections for handling transfers between ships, barges, rail cars, and trucks. “This expansion will allow our current companies to continue to grow and help us attract new business for our port and the Northwest Indiana economy,” Hirt said. About the Port of Indiana-Burns Harbor: The Port of Indiana-Burns Harbor opened in 1970 and is one of three facilities operated by Ports of Indiana. Established in 1961, the Ports of Indiana is a statewide port authority managing three ports on the Ohio River and Lake Michigan. The Ports of Indiana is a self-funded enterprise dedicated to growing Indiana’s economy by developing and maintaining a world-class port system. Information: portsofindiana.com. Follow us on Twitter: @PortsofIndiana.